Sir Miles Warren "An Autobiography"
Read what architect Sir Miles Warren has to say about his Dorset Street Flats in his 2008 autobiography. 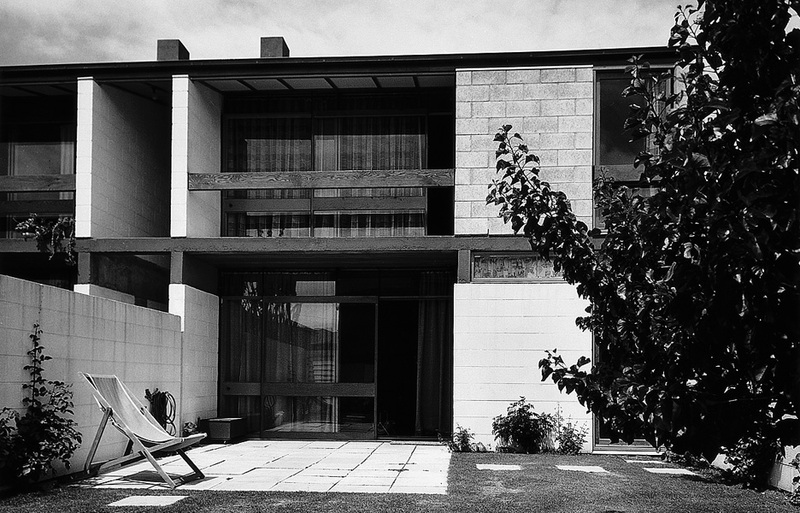 The Dorset Street Flats in Christchurch were designed and built between 1956-57, and have been described as being “amongst the most important domestic buildings built in New Zealand in the second half of the twentieth century.” The work of Miles (later Sir Miles) Warren, the flats are one of the earliest attempts in the country to construct a building from load-bearing concrete block, and are the pioneer for what would later become known as “The Christchurch School” of post-war architecture. Lauded by critics, so radical was the design at the time that many of the public labelled it “one of the ugliest buildings in the city”, and tour buses were said to have driven past to allow for a viewing of “Fort Dorset”. Warren himself occupied one of the flats between 1958-65. The buildings are listed as Group 3 on the Christchurch City Council’s “List of Protected Buildings, Places and Objects”. In 1999, DOCOMOMO New Zealand added the flats to their “Top 20” list of Modern Movement buildings. The flats were extensively damaged in the February 2011 Canterbury Earthquake, and have been in limbo since that time. A long-awaited restoration project is now underway, and can be followed both on this website and on Facebook at www.facebook.com/dorsetstreetflats.